Sally Anne Badger hasn't added a story. We're very close to completing 'Bean' the short film, but we need a little more gold to make it all the way. Producer Sally Anne Badger has seen Bean through from the very start; from commissioning the script to pre-production all the way to our incredible four day shoot this Summer. She gathered together a fantastic team who worked hard to create the very best film they could about a subject matter they are all passionate about. After successfully securing £6000 to shoot Bean via private investment, we are now hoping to raise a further £2000 for the editing process. This would include money for an editor, sound designer, colourist and composer, enabling us to finish the film ready for screening. We are enormously grateful for any donations, big or small, to help us complete and do justice to this meaningful project. 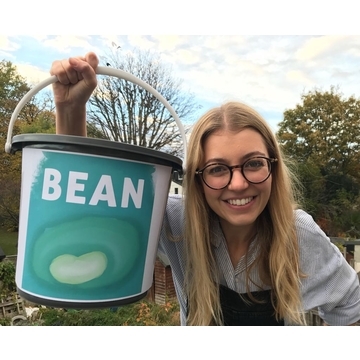 As a thank you to all investors, you will be invited to the premiere screening in the Spring and sent regular updates on how Bean is progressing. 'Bean' is a heartwarming comedy-drama, telling a story of gay parenting with sensitivity, complexity and love. We believe it is time to tell stories exploring new ways to parent which humanise rather than sensationalise. 'Bean' is written by Máirín O'Hagan and Sarah Anson, two fresh, female writers, who specialise in TV comedy / drama, as well as feminist history plays. Máirín's recent comedy 'The Assembly Women' at VAULT festival was recommended by the Guardian as one to watch, and the two have recently had a TV sitcom optioned for development. For theatre, they write as duo Queynte Laydies (www.queyntelaydies.com) - their Shakespeare-inspired play Lady Percy will have its world premiere in the US later this year and was a finalist in the American Shakespeare Centre's 'Shakespeare's New Contemporaries' competition. Attracted by the quality of the original, timely and engaging script, we have managed to secure an incredibly talented, award-winning cast and creative team. Our lead actress, comedian Lou Sanders, has appeared on on BBC1, Comedy Central & Dave, and in shows such as 'Russell Howard's Good News’, 'Alan Davies: As Yet Untitled’ and Karl Pilkington’s new sitcom ‘Sick Of It’. Our male lead Cian Barry is known for his roles in ‘Doctor Foster’, ‘New Tricks’ and ‘Shameless’ as well as a leading role in the critically acclaimed horror-comedy 'Nina Forever’. Legendary actress Louise English has had an extensive West End and TV career - her first ever film credit was ‘Bugsy Malone’! Director Clare Macdonald came up with a brilliant vision for Bean. Her films have been screened at BAFTA and OSCAR-qualifying festivals across the world, been nominated for Best Comedy and Best Writing, and won the NFTS Star of Tomorrow Award at BAFTA. She is a mentor, panelist and visiting tutor at the London Film School. Thank you for reading about our project. We can’t wait to show you a finished film soon! Sally Anne Badger hasn't posted any updates yet. Sally Anne Badger is managing the funds for this campaign. The campaign is for a personal cause.